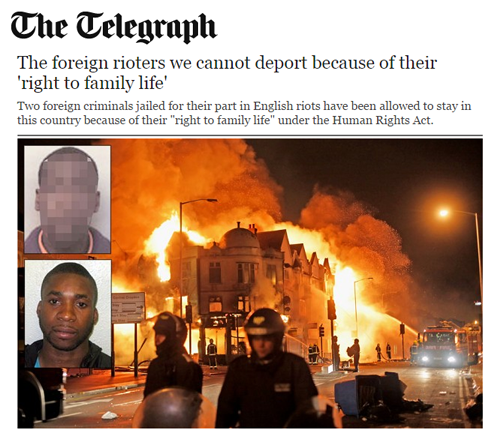 Today The Telegraph published a story about two foreign criminals, jailed for their part in the English riots, who successfully appealed against deportation because of their ‘right to family life’ under Article 8 of the European Convention on Human Rights. Article 8 of the European Convention on Human Rights may appear to provide a ‘right’ for foreign criminals to stay in the UK, but this ‘right’ is only upheld in “truly and exceptional” cases. So, either our judiciary is not properly interpreting the Human Rights Act, or else these cases are not being properly, or fully, reported in the media. 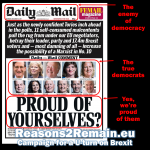 This entry was posted in Current Affairs, Democracy & Citizenship, Law & Justice, Media & Communications, Politics & Public Policy, Security & Defence, The EU and tagged Deportation, English riots, European Convention on Human Rights, foreign criminals, Human Rights Act, Jon Danzig, Right to family life, Section 8, Telegraph. Bookmark the permalink. Next: HSBC Bank: Is Britain’s future in Europe? That’s not an argument, it’s a statement of the obvious. the telegraph makes the case that in these instances the judiciary is not properly interpreting the Human rights Act. If you want to make the case for why thses two criminals have a ‘right’ to stay in this coutnry, go ahead and make it. And most people believe they ashould all fail, indeed that there should be no right to appeal at all. Again, it’s incumbent on people like yourself to explain why any foreign criminals, especially violent ones, should be allowed to stay. becuase the public just isn’t seeing it, and they have plenty of cases to point to as illustration of how grotesquely the system has been abused. And please note, Jon, ‘only a little’ abuse of it is not acceptable. You are being disingenuous. The Human rights Act you refer to was made law less than 20 years ago. It is not legislation from the aftermath of WW2. We managed perfectly well without it, and the only people who have profited from the new farcial Act have been criminals and lawyers, certainly not victims and their families. It’s for the British courts, and not for me, to interpret the Human Rights Act 1998, as is the case with all Acts of Parliament. The European Convention on Human Rights of 1950, on which the Human Rights Act 1998 is an extension, together with the United Nations Universal Declaration of Human Rights of 1948, are universal rights that apply to all humans, even criminals. The United Kingdom is a signatory to both conventions. My article was to present facts (rather than arguments); in particular, that contrary to popular media misconceptions, only in rare and exceptional circumstances do criminals avoid deportation because of the Human Rights Act. For example, the Act prevents anyone being deported to a country where they may be subject to torture; or when the evidence against them was obtained by torture. This is a protection for all humans, including you and me. If human rights are taken away from one human, they are taken away from all of us. It’s a universal right. However, it should be understood that the Human Rights Act doesn’t prevent criminals from being correctly prosecuted or imprisoned if they are found to be guilty. You wrote that, ‘it’s incumbent on people like yourself to explain why any foreign criminals, especially violent ones, should be allowed to stay’. 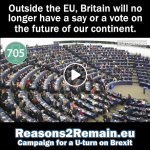 It is not incumbent upon me to explain why, since the European Convention on Human Rights already provides all the details and provisions, which the United Kingdom has been party to since the convention became a binding international agreement in 1953. No, the European Convention on Human Rights, which has nothing to do with the European Union, was drafted by British lawyers in direct response to the abject abuses of human rights immediately after the Second World War. 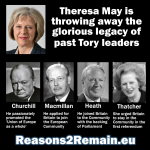 It’s an international treaty to which Britain was a founder signatory in 1950, and it came into force in 1953. Anyone who believes that their human rights have been breached by the state can apply to the European Court of Human Rights in Strasbourg (again, this is nothing to do with the European Union). The Convention actually was not a new idea, but based upon the English Bill of Rights (1689), the American Bill of Rights (1789), the French Declaration of the Rights of Man (also 1789). 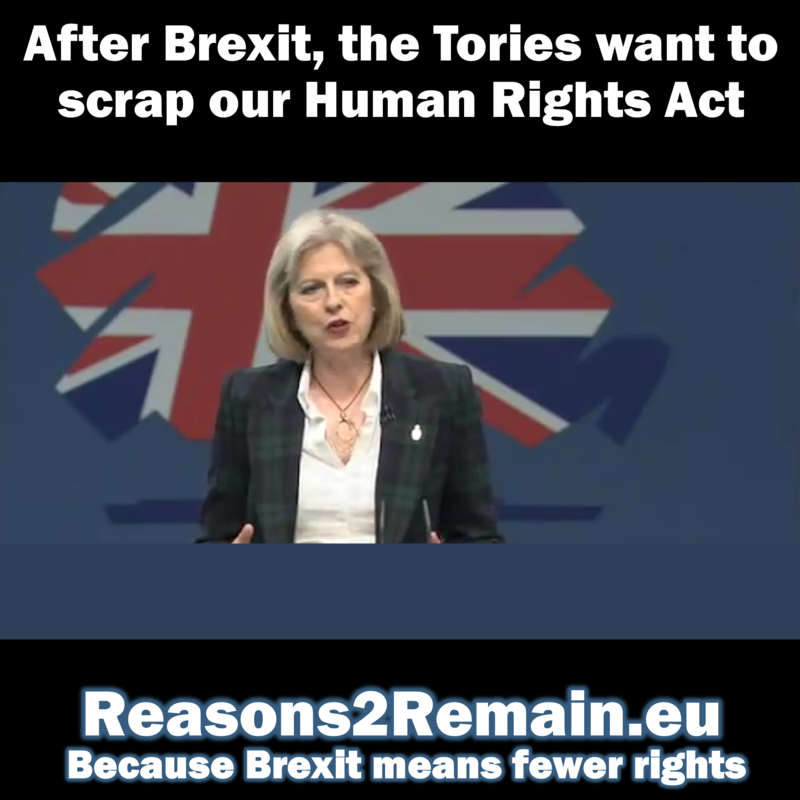 The Human Rights Act of 1998 simply gave ‘further effect’ to the rights of the European Convention on Human Rights, and in particular makes it possible for UK courts to hear alleged breaches of the Convention, without citizens having to go the European Court of Human Rights. But since the 1950s British citizens have had the right to refer breaches of their human rights to the court in Strasbourg. The Court of Human Rights has a bad press in Britain, but for thousands of desperate people it is their last shot at justice. Finally, where there is evidence that a statement is inaccurate, it’s helpful to point it out so that it may be corrected. However, to describe me personally as ‘being disingenuous’ (i.e. 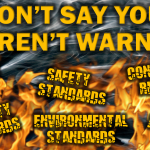 false, insincere, misleading), without any merit or substance, simply isn’t acceptable.